Villagers ecstatic as artificial lake starts overflowing after a gap of over 30 years. In all, 74 tanks were rejuvenated under Mission Kakatiya phase I during 2016-17. Hyderabad: Celebrations erupted in the villages of Ghanapuram revenue mandal as Ganapa Samudram, a large artificial lake, started overflowing after a gap of over 30 years. 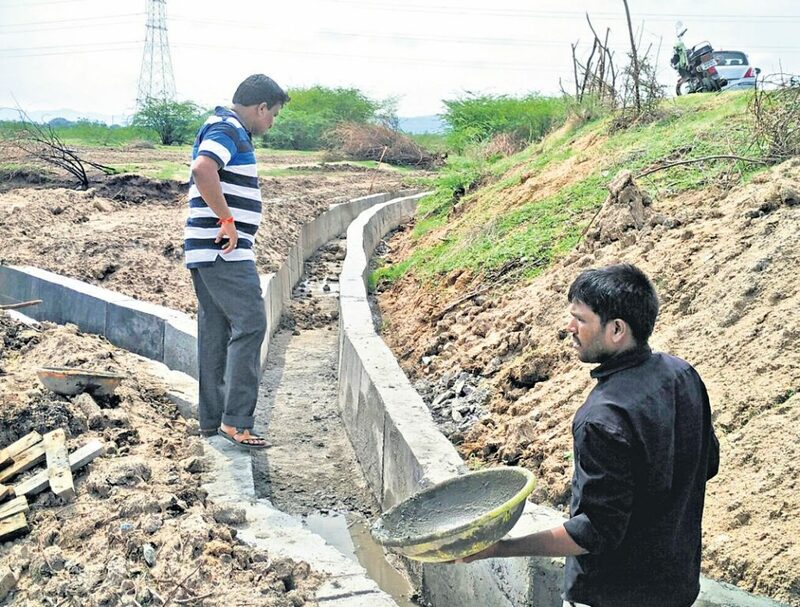 An irrigation tank being in surplus in the month of February is indeed unusual and sounds incredible since it is in Telangana’s Palamuru region that was known for its drought and distress and large scale migrant labour. Ganapa Samudram tank is full to the brim, and farmers of villages in the vicinity say this is only the third time in over 100 years that they are seeing this phenomenon. It is dream come true for them after Telangana attained statehood, thanks to the release of water for the first time to Ghanapuram canal from the Kalwakurthy project. Irrigation tanks in the region are artificial reservoirs with huge storage capacities and each one of them is fondly referred to as “Samudram” – an ocean in itself. They are part of Kakatiya tradition of harvesting and preserving the local rainfall and water from streams and rivers for later use, primarily for agriculture and drinking water. Seven such tanks called ‘Sapta Samudralu’ (Seven Seas) in the area were rejuvenated under the Mission Kakatiya, the flagship programme of the State government intended for revival of over 46,000 minor irrigation sources such as tanks, ponds and lakes all over the State. Water flowing into the farm land from the feeder channels without the use of power or a pumpset happened for the first time. The area is dotted with dried-up wells and defunct borewells and farmers never dreamt of seeing an end to their travails so early. With the water making its way to the parched land that never had any crops in Yesangi has rekindled hope among the farmers. It began to replenish the groundwater table too. Some 200 borewells that did not yield even a drop of water to quench the thirst of people for years now became a major dependable source of supply for people. Groundwater could be accessed today even by sinking borewells even to a minimum depth of 10 metres. In all, 74 tanks were rejuvenated under Mission Kakatiya phase I during 2016-17. These tanks were filled releasing water from Kalwakurthy lift scheme and it helped in irrigating 12,399 acres. Another 246 tanks were covered under Mission Kakatiya Phase II reviving the original source of irrigation for 22,539 acres. In addition to this another seven large tanks such as Ranga Samudram, Gopala Samudram, Shankaramma Samudram, Mahabhupala Samudram, Raya samudram, Krishna Samudram, and Veera Samudram had an ayacut of some 10,000 acres of land. Some of these tanks including Krishna Samudram and Ranga Samudram were linked to the Bhima Lift irrigation scheme. It helped in extending irrigation to an additional 20,000 acres. The Sankara samudram tank, that was built some 160 year ago was also proposed for linking up with Bhima to support irrigation to an ayacut of 2,700 acres. A majority of the ‘sagars’ rejuvenated under Mission Kakatiya and provided a assured water source with the completion of major projects pending in the region for decades helped in reviving the hopes of the peasant community. Attributing the marked change achieved in the irrigation front in Palamuru region to the sustained efforts of the irrigation Minister, T Harish Rao, Deputy Chairman of the State Planning Board, Singireddy Niranjan Reddy, said that people who deserted these areas in search of employment were returning to their villages. Revival of the unique irrigation system of Telangana, with the rejuvenation of the small irrigation source, a dream of the Chief Minister , K Chandrashekhar Rao had come true.